Best Infrared Electric Fireplace Reviews: 6 Top-Rated Choices! Nowadays, traditional fireplaces are no longer practical. Not only are they messy, but they are also high maintenance. Infrared heaters or fireplaces are the new rages on the market recently because of their effectiveness and efficiency. In fact, the heat coming from an infrared fireplace is twice the heat that an ordinary electric fireplace produces. In addition, infrared heating is more natural and warmer. Thus, many consider owning the best infrared fireplace a great investment. If your main purpose of buying an infrared fireplace is to further beautify the room, then Alcott Hill offers the best electric fireplace that gives an adequate heating capacity and a decorative potential­. The Contreras Infrared Fireplace is a favorite choice when it comes to giving your room a fresh new interior. It’s a freestanding furniture that is made of three main materials: metal, glass, and premium wood. It’s a great statement piece in your living room or bedroom. The polished premium wood surely adds elegance to your interior design. The fireplace is equipped with thermal overload protection, so you won’t get burned even if you accidentally touch the fireplace while in operation. There are built-in shelves where you can put books and other decorative pieces. You can even put a TV on top of the fireplace. Whether you use it at home or in an office, this fireplace surely adds aesthetic value to any room. 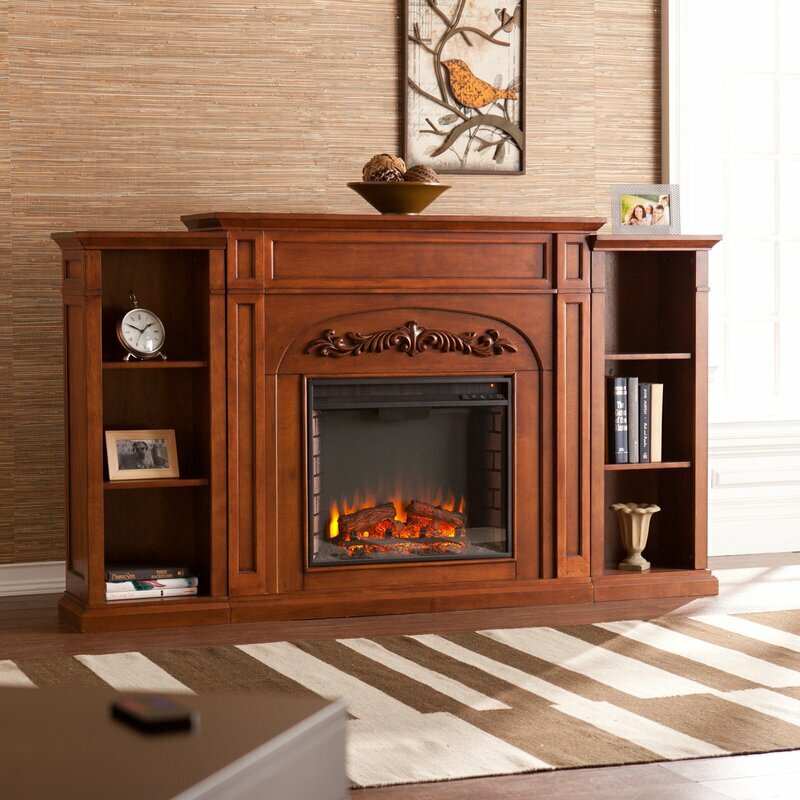 You can’t go wrong with this Duraflame Electric 3D Infrared Fireplace. This utilizes quartz heating, which produces medium wave infrared heating and drying. 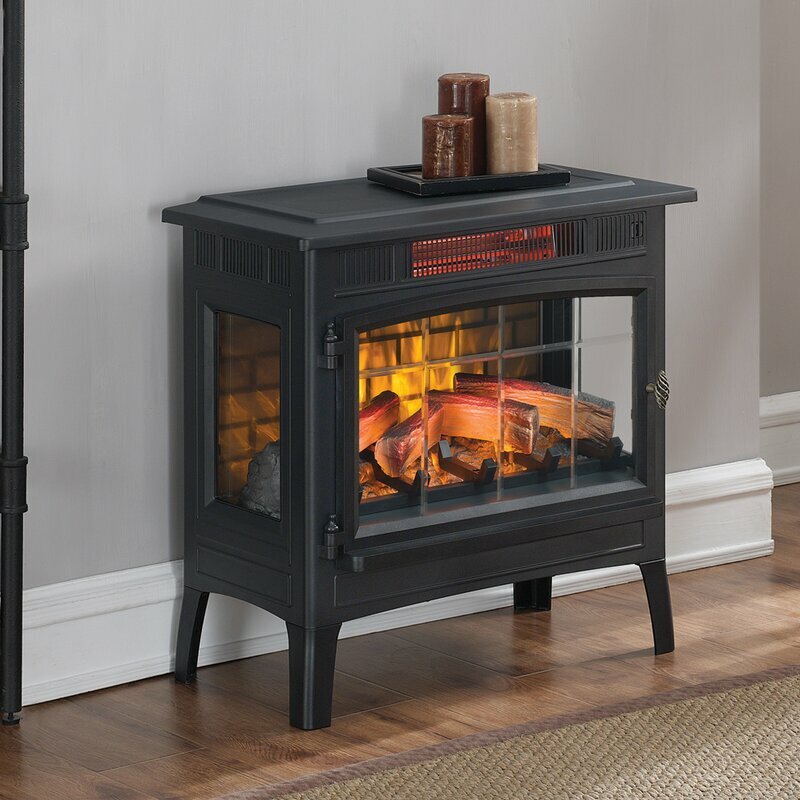 You can get this fireplace/heater in different colors, but the black model, in particular, is a best-seller as it offers the best value, not to mention that it looks great in any home interior. It has a sturdy metal frame, which makes transporting the product also easy. A lot of the users said that the fireplace doesn’t get too hot to touch, so they feel safe to use it around children and pets. This fireplace is portable, so you can use it in any rooms. It has a remote control, which allows you to control the heat coming from the fireplace. This may look small, but it can actually heat rooms up to 1000 square feet. 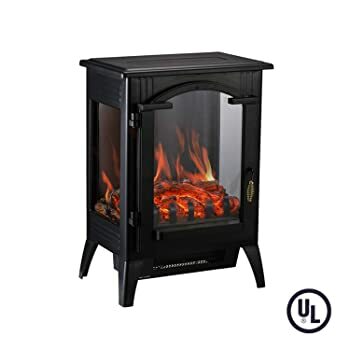 Small but powerful is what most infrared fireplace reviews call this Jackson Black Infrared Fireplace by Comfort Smart. Well, this fireplace only weighs 34 pounds but can heat up a room with up to 1000 square feet. This has a total of 4800 BTUs, which is not far behind as compared to the 5200 BTUs of most infrared heaters. Jackson Black Infrared Fireplace by Comfort Smart offers the same heating capacity but in a less weight and in a bargain price. A sweet deal indeed! This comes with a digital thermostat, something that you wouldn’t see in most small portable infrared heaters. You can also set a timer for this fireplace. The log set flickers and dazzles realistic flame effects, thus giving the illusion of a real wooden log. If you have limited space in your room, this fireplace is a great option for you. Not all fireplaces and heaters can be easily adjusted from high to low heat and vice versa. Well, Duraflame has set the bar high and introduce an amazing product on the market. Introducing the durable, powerful, and lightweight best infrared electric fireplace from Duraflame, the DFI-550-39 Quartz Infrared Fireplace. With just a glance, you can tell that this fireplace is well-made. There are also various colors to choose from: Black, Cinnamon, Cool Gray, and Cream. But for a more sophisticated look, Cinnamon and Cream models are the best options. This is one of the lightest and most portable fireplaces on the market. It’s key-selling feature is that it has a low and high heat setting, which helps you set the amount of heat you want. You can control the heat and the brightness of the flame using the remote control. There is also the option of using the heat alone, the flame alone, or using both simultaneously. But what impresses the users the most is that you can leave this one overnight. But as for safety purposes, use overnight occasionally only. This is to give the heater time to rest. Unlike any other heaters with blower, this fireplace blows warm air quietly. You can barely hear the sound of the blower. What’s the best electric fireplace for people who live in a small apartment or in a studio type flat? A portable quartz infrared fireplace, of course! The Wonlink Infrared Fireplace is a portable unit that utilizes quartz heating. It only heats a room with up to 323 square feet and has a maximum power of 3400 BTUs. If you don’t mind buying an infrared fireplace for personal use, then this is most practical choice. This is obviously cheaper. 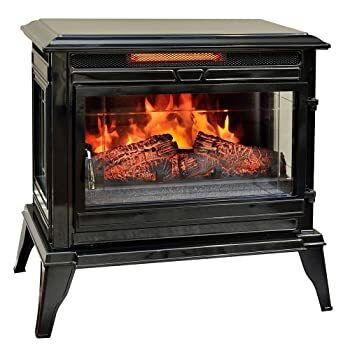 So, if you are on a tight budget but still wants something that can give you warmth in winter, this is a great alternative for a centralized heater. You can use this fireplace with a peace of mind as it is proven safe to use by the Canadian Standard Association. The 3D flame effect can be used even when the heat setting is turned off. 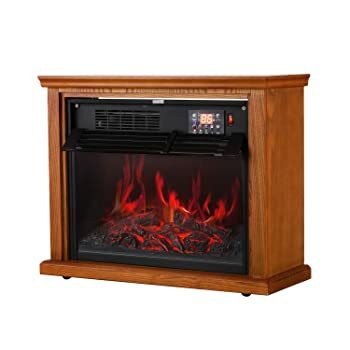 Use this infrared fireplace in the living room, kitchen, bedroom, and even in your dorm room! It can heat up the surrounding quickly. They say to save the best for last. 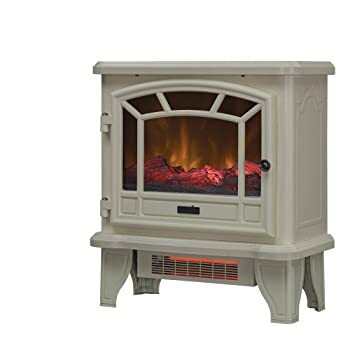 Well, I am excited to introduce my ultimate favorite from the list, the Portable Quartz Infrared Fireplace by Outdoor Basic. There are a lot of things to love about this heater. It’s effective, efficient, portable, and the price is reasonable. You will certainly get more than you pay for. It doesn’t have 2 but 3 infrared tubes! So, it can heat the room real fast. The safety thermal cut-off device of the heater ensures no overheating occurs, thus your safety is guaranteed. This also features a LED displace screen, so you can monitor the temperature of the room. You can even set a timer for this fireplace for as long as 12 hours! Proven safe to use by several entities; its certifications include Canadian Standard Association, as well as ETL and UL that are both nationally recognized testing laboratories in America. I am into best value product, but safety is one thing that I never compromised. That is why I always look into the safety and quality control when choosing the best fireplace to buy. So far, the Outdoor Basic Portable Quartz Infrared Fireplace has ticked all the box in my checklist. It’s efficient and can heat the room quickly, thanks to its 3 infrared tubes. I also love that it has an LED display screen and a thermal cut-off device. Lastly, it can be used overnight; just set the timer and have a cozy sleep all night.